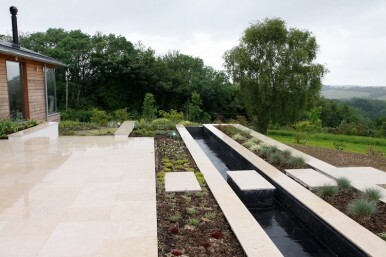 This large area of garden paving on a project in Hampshire was built during the winter months. Extensive excavation was undertaken to ensure a stable base was provided and all base layers were compacted as work proceeded. The base layers had drainage pipes and conduit tubing running through for irrigation, lighting and audio systems to be installed nearer completion. A full concrete base was laid upon the granular base layers ready for the paving. A stainless steel 10mm flush channel drainage system was installed against the large door openings. The paving is limestone with a honed finished and reflected the interior flooring to provide continuity between interior and exterior. The paving was laid on a full mortar bed with a slurry mix applied to the rear of the slabs to ensure a full adhesion. The paving was laid to fall away from the house for surface water drainage. There were 5mm mortar joints which were filled flush with the paving.